Background and objectives The plasma concentration of the endogenous inhibitor of nitric oxide synthase asymmetric dimethylarginine (ADMA) associates with sympathetic activity in patients with CKD, but the driver of this association is unknown. Design, setting, participants, & measurements In this longitudinal study (follow-up: 2 weeks–6 months), repeated measurements over time of muscle sympathetic nerve activity corrected (MSNAC), plasma levels of ADMA and symmetric dimethylarginine (SDMA), and BP and heart rate were performed in 14 patients with drug-resistant hypertension who underwent bilateral renal denervation (enrolled in 2013 and followed-up until February 2014). Stability of ADMA, SDMA, BP, and MSNAC over time (6 months) was assessed in two historical control groups of patients maintained on stable antihypertensive treatment. Results Time-integrated changes in MSNAC after renal denervation ranged from –40.6% to 10% (average, –15.1%), and these changes were strongly associated with the corresponding changes in plasma ADMA (r= 0.62, P=0.02) and SDMA (r=0.72, P=0.004). Changes in MSNAC went along with simultaneous changes in standardized systolic (r=0.65, P=0.01) and diastolic BP (r=0.61, P=0.02). In the historical control groups, no change in ADMA, SDMA, BP, and MSNAC levels was recorded during a 6-month follow-up. Conclusions In patients with resistant hypertension, changes in sympathetic activity after renal denervation associate with simultaneous changes in plasma levels of the two major endogenous methylarginines, ADMA and SDMA. These observations are compatible with the hypothesis that the sympathetic nervous system exerts an important role in modulating circulating levels of ADMA and SDMA in this condition. A large series of observations from cell biology to experimental medicine in healthy humans and in disease states indicate that the sympathetic system is a fundamental regulator of endothelial function (1). In previous studies we documented that sympathetic activity and the endogenous inhibitor of endothelial nitric oxide synthase asymmetric dimethylarginine (ADMA) are closely interrelated and apparently share a common pathway leading to myocardial and renal damage in patients with stages 2–4 CKD (2) and to death and cardiovascular complications in patients on dialysis (3). However, in these studies the relationship between muscle sympathetic nerve activity corrected (MSNAC), plasma norepinephrine, and ADMA was examined only in steady-state conditions, and until now there is no experimental study testing whether interfering with sympathetic activity modifies circulating ADMA levels. The ADMA enantiomer symmetric dimethylarginine (SDMA) (4) is another relevant methylarginine which may interfere with endothelial function by various mechanisms, including modification of the HDL cholesterol molecule (5). SDMA has been associated with the risk of atherosclerotic events (6), but to our knowledge there is no study investigating the relationship between SDMA and sympathetic activity. Observations in resistant hypertension show that renal denervation may result in a marked reduction in whole-body norepinephrine spillover (7) and into a sustained decrease in MSNAC (8), even though these findings were not replicated in all studies (9,10). Renal denervation in resistant hypertension represents a unique model to further examine the hypothesis that sympathetic activity modulates circulating ADMA and SDMA levels. In the context of a multifaceted research program aimed at investigating the cardiovascular effects of renal denervation, we recruited a group of 14 patients with resistant hypertension in which we performed sequential measurements of MSNAC over time after the procedure and systematically collected simultaneous plasma samples to study the longitudinal evolution of sympathetic activity and plasma ADMA and SDMA levels after renal denervation. After the publication of the Symplicity 3 trial results, the renal denervation research program at our institution was temporarily stopped. For this reason we decided to report an analysis of these studies in this series of patients. This study was approved by the Ethics Committee of the Istituto Auxologico Italiano, Milan, Italy, and it was in conformity with the Declaration of Helsinki. Patients were recruited for this specific study and treated with the renal denervation procedure in 2013, with a subsequent follow-up which lasted until February 2014. Initial assessment included physical examination, BP, and renal function measurements. Written informed consent was obtained from all patients. Patients were eligible for renal denervation if they had an office systolic BP ≥160 mmHg while on at least three antihypertensive drugs (including a diuretic); were >18 years old; did not have any known secondary cause of hypertension; and had a GFR, estimated with the Modification of Diet in Renal Disease formula, ≥45 ml/min per 1.73 m2. Patients with congestive heart failure, coronary and cardiovascular disease, atrial fibrillation or other major cardiac arrhythmias, diabetes mellitus, valvular heart disease, obesity, obstructive sleep apnea, and those displaying poor adherence to antihypertensive drug treatment were also excluded from this study. The main patient characteristics are listed in Table 1. To assess the stability of MSNAC (corrected for heart rate) and BP in patients with resistant hypertension not submitted to renal denervation, we resorted to a historical control group of 12 patients with resistant hypertension on long-term follow-up at the Clinica Medica of Milan University (Table 2). These patients had been treated with antihypertensive therapy only and had repeated MSNAC measurements at a 6-month interval while antihypertensive treatment was maintained nearly constant over the same interval. To assess the stability of ADMA and SDMA over time in patients with multiple antihypertensive therapy, we extracted from the clinical and biologic databases at the CNR Research Unit of Reggio Calabria (Italy) a series of 11 patients with hypertensive nephrosclerosis with severe hypertension where BP control was achieved by the use of at least three drugs, including a diuretic (Table 2). In these patients with stabilized BP and constant antihypertensive treatment, longitudinal measurements of ADMA, SDMA, and BP were repeated twice at 6-month intervals. Multiunit recording of MSNA was performed in a semidark and quiet room at a constant temperature of 20°C–21°C, according to the standard protocol at our institution, as previously described (11). BP was measured by a standard sphygmomanometer 30 minutes after the insertion of an intravenous cannula while patients were relaxed and accustomed to the experimental environment (standardized BP) and immediately before MSNA recordings. MSNA was quantified over each 30-minute period and was expressed as bursts per 100 heartbeats, that is, as MSNA corrected for heart rate values (MSNAC). The normal MSNAC in our laboratory measured in a series of 31 healthy subjects with an average age of 57±7 years is 45 bursts per 100 heartbeats (95% confidence interval, 42 to 50 bursts per 100 heartbeats) (11). Routine laboratory measurements were made in the central laboratory of our institution. Plasma ADMA (12) and SDMA (13) were measured by validated ELISA methods by using commercially available kits by DLD Gesellschaft für Diagnostika, Hamburg, Germany. Normal ranges of plasma ADMA and SDMA determined by this method are 0.40–0.75 and 0.30–0.70 µMol/L, respectively. The study contemplated up to five experimental sessions. The first session was performed 5 days before the renal denervation. The other four sessions were contemplated 15 days and 1, 3, and 6 months after the procedure. In this series 12 patients had at least three paired measurements of methylarginines and MSNAC, whereas the two remaining patients had only two paired measurements (Supplemental Figures 1 and 2). In each experimental session the patients came to the laboratory in the morning, after a light breakfast and an overnight abstinence from alcohol and coffee consumption. They were put in the supine position and fitted with the intravenous cannula and the various measuring devices, except the microelectrode for MSNA recording. Blood samples for various assays were taken 30 minutes after positioning the venous cannula, after which BP was measured three times with a mercury sphygmomanometer (standardized BP), and a microelectrode was inserted into the right or left peroneal nerve to obtain MSNA. Sympathetic nerve traffic was recorded together with finger BP, heart rate, and respiration rate during a 30-minute period in a quiet semidark room kept at a constant temperature of 22°C–24°C. Renal denervation was carried out by using a radiofrequency ablation catheter (Symplicity; Medtronic Ardian, Palo Alto, CA), following the protocol and sequence of interventions (which included renal angiograms) described in previous articles (8–10). Data were analyzed by a single investigator unaware of the experimental design and of the belonging of each patient to the different experimental sessions. The day before the MSNA measurement, in all but one patient (patient 5 in Supplemental Figures 2 and 3 and Supplemental Table 1), we recorded 24-hour ambulatory BP (Spacelabs 90207; Spacelabs), with the readings set at 15- and 20-minute intervals during the daytime (7:00 AM–11:00 PM) and nighttime (11:00 PM–7:00 AM) periods, respectively. Data are expressed as mean±SD, median and interquartile range, or as percentage frequency, as appropriate. Variables showing a positively skewed distribution were log transformed (ln) before the correlation study. The evolution of MSNAC, ADMA, and SDMA at two or more time points after renal denervation is described case by case in appropriate figures (Supplemental Figures 1 and 2). Average values at various time points in the whole group were calculated on the basis of available measurements at the same time points. The analysis of the relationship between time-integrated changes in MSNAC versus ADMA and SDMA was on the basis of the calculation of the areas under the curves (14) of these variables after renal denervation. In brief, we calculated the difference between the expected area under the curve of MSNAC and methylarginines assuming that renal denervation has no effect on these variables (i.e., a rectangular area formed by individual baseline values [short side, height of the rectangle] and the individual time of observation [long side, base of the rectangle]) (Figure 1) and the actual area under the curve. We then expressed this difference as a percentage of the expected value. This difference gives an estimate of the changes in variables of interest after renal denervation. Identical calculations were applied to BP and heart rate data. On the basis of these data we performed regression analyses testing the association between MSNAC changes after renal denervation and the corresponding changes in ADMA, SDMA, BP, and heart rate. Partial correlation coefficients were calculated and reported wherever appropriate. All calculations were done by a standard statistical package (SPSS for Windows Version 9.0.1; SPSS, Chicago, IL). Calculation of the difference between the expected area under the curve of study variables (MSNAC in the example). We calculated the difference between the expected area under the curve of MSNAC assuming that renal denervation has no effect on this variable (i.e., a rectangular area formed by individual baseline value [short side] and the individual time of observation [long side]) and the actual area under the MSNAC curve. We then expressed this difference as a percentage of the expected value. MSNAC, muscle sympathetic nerve activity corrected. As shown in Table 1, the 14 patients enrolled into this study were on average 63 years old. All were being treated with more than three antihypertensive drugs, including a diuretic, at full daily dosage. Their standardized BP was 171/95 mmHg, and their 24-hour ambulatory BP monitoring (ABPM) was 158±14/89±4 mmHg. Seven patients were overweight (body mass index=26–30 kg/m2), but none were obese (body mass index >30 kg/m2). Ten patients had microalbuminuria, whereas none had a GFR<45 ml/min per 1.73 m2. Six had left ventricular hypertrophy at the echocardiographic examination. Table 1 shows the number and type of antihypertensive medications used by the resistant hypertensive patients, which remained unmodified throughout the follow-up period in 12 patients and changed in two patients (daily dosage of an angiotensin-converting enzyme inhibitor was reduced in one patient, whereas in the other patient the β-blocker used was stopped). Median MSNAC was 65 bursts per 100 beats, being above the upper limit of the 95% confidence interval (50 bursts per 100 heartbeats) in all patients (Supplemental Figure 1, time 0). ADMA was on average 0.61 µMol/L, and in no patients did it exceed the upper limit of the normal range (0.75 µMol/L) (Supplemental Figure 1). Average SDMA was 0.59 µMol/L, and only in two patients (patients 3 and 11) did it exceed the upper limit of the normal SDMA range (0.70 µMol/L) (Supplemental Figure 2). Renal denervation was successfully carried out in all 14 patients, with an average number of 12.9±2.5 ablations per patient. No complications were reported during, immediately after, and over the longer term period after the procedure. The individual time course of MSNAC and ADMA and SDMA levels at baseline (presympathetic denervation) and at various time points during follow-up is shown in Supplemental Figures 1 and 2 (ADMA/SDMA). Changes in time-integrated MSNAC values after renal denervation had a wide range, from –40.6% to 10% (average, –15.1%), and observed time-integrated MSNAC values were significantly less (P=0.02) than the corresponding expected values (Figure 1). Overall, changes in time-integrated MSNAC were strongly associated with the corresponding time-integrated changes in plasma ADMA and SDMA (Figure 2). Time-integrated standardized systolic (–9%; range, –45% to 11%) and diastolic BP (–8%; range, –25% to 18%) were less than expected (P=0.03 and P=0.004) while heart rate (–0.4%; range, –13% to 8%) was not (P=0.32). Time-integrated 24-hour ABPM changes were –3.4%±2.8% for systolic BP (P=0.006) and –7.0%±3.3% for diastolic BP (P<0.001). Remarkably, time-integrated changes in MSNAC went along with simultaneous changes in time-integrated standardized BP (systolic, r=0.65, P=0.01; diastolic, r=0.61, P=0.02) (Figure 3), whereas no relationship between MSNAC and 24-hour systolic (r=–0.46, P=0.11) or diastolic BP (r=–0.43, P=0.15) was found. Relationship between changes in MSNAC and simultaneous changes in ADMA and SDMA. The distribution of standardized residuals of the MSNA-ADMA link was bimodal. For this reason the data are presented in log-transformed scales. ADMA, asymmetric dimethylarginine; MSNA, muscle sympathetic nerve activity; MSNAC, muscle sympathetic nerve activity corrected; SDMA, symmetric dimethylarginine. 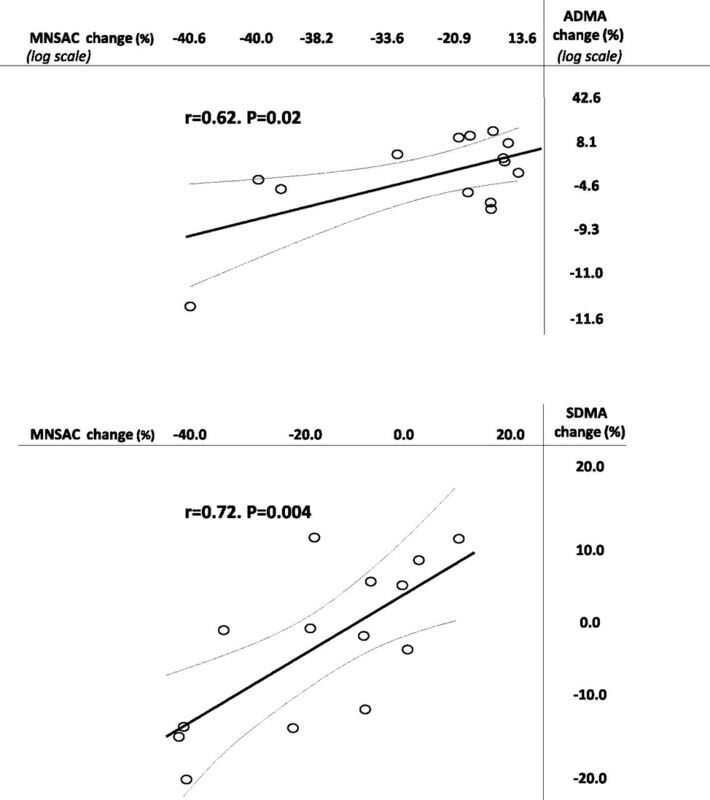 Relationship between changes in MSNAC and simultaneous changes in BP. DBP, diastolic BP; MSNAC, muscle sympathetic nerve activity corrected; SBP, systolic BP. Individual absolute BP, heart rate, ABPM, MSNAC, and methylarginine data before renal denervation and at each time point after denervation are reported in Supplemental Table 1. In these historical control groups (maintained on stable antihypertensive treatment only), no change in ADMA, SDMA, BP, and MSNAC levels was recorded during a 6-month follow-up (Figure 4). Box and Whisker plots. Left panel (first historical control group) shows the stability of MSNAC over a 6-month interval in 12 patients with resistant hypertension maintained on constant drug treatment. 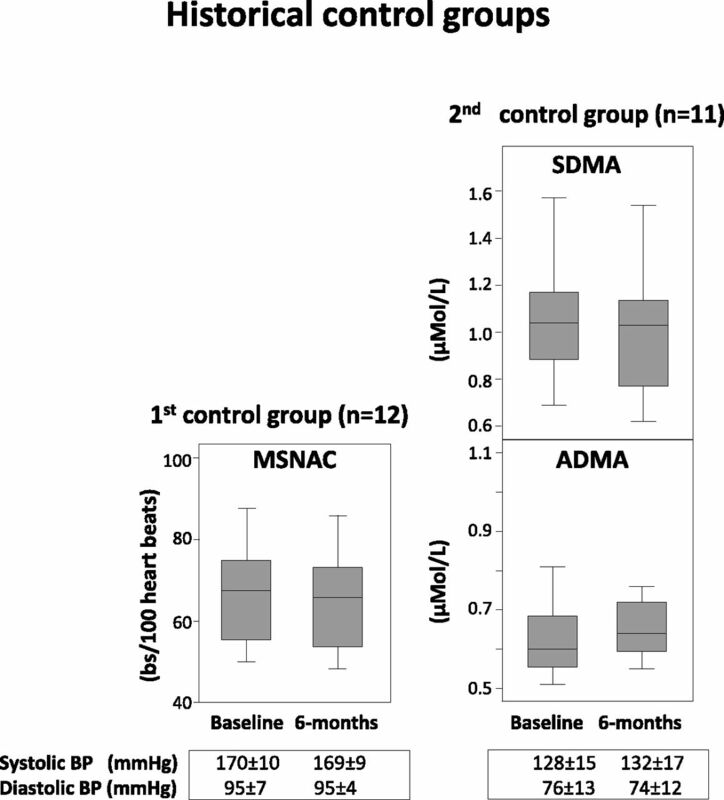 Right panel (second historical control group) shows the stability of ADMA and SDMA over a 6-month interval in 11 patients with hypertensive nephrosclerosis and severe hypertension where BP control was achieved by the use of at least three drugs, including a diuretic. Data are presented as median (middle line of the rectangle) and interquartile range (bottom and upper line of the rectangle), 2.5th and 97.5th percentiles. ADMA, asymmetric dimethylarginine; MSNAC, muscle sympathetic nerve activity corrected; SDMA, symmetric dimethylarginine. This study shows that in patients with resistant hypertension changes in sympathetic activity after renal denervation associate with simultaneous changes in plasma levels of the two major endogenous methylarginines, ADMA and SDMA. Overall, these findings are in keeping with the hypothesis that the sympathetic nervous system modulates circulating ADMA and SDMA levels in this population. Several lines of evidence in humans point to an inverse association between sympathetic activity and endothelium-dependent vasodilatation and vice versa. Sympathetic activity reaches the zenith value in the early morning hours (15) coincident with the nadir of endothelial function (16), and there is robust evidence that endothelial function is inversely related to circulating norepinephrine in healthy humans (17). Lower-body negative pressure (18) and mental stress (19) (i.e., two powerful stressors augmenting sympathetic activity) markedly reduce endothelium-dependent vasodilatation. Physical activity, an intervention which reduces sympathetic outflow, also restores endothelial function (20,21). Conversely, nitric oxide system inhibition by LNMA and ADMA activates the sympathetic system in experimental models (22), and at strictly comparable BP levels, sympathetic nerve activity is substantially higher during systemic LNMA infusion than during phenylephrine infusion in healthy humans (23). The strong inverse link between the sympathetic system and the endothelium extends to human diseases because endothelium-dependent vasodilatation is profoundly impaired in patients with pheochromocytoma (24) and in other conditions characterized by high sympathetic activity, such as CKD (11). However, mechanisms linking sympathetic activation to endothelial dysfunction still remain scarcely characterized. In this study, time-integrated changes in sympathetic nerve firing after renal denervation were strongly related with the simultaneous time-integrated changes in ADMA and SDMA. These associations are remarkable because, in global terms, renal denervation had just a mild to moderate effect (estimated change: –15.1%) on MSNAC and because baseline ADMA and SDMA were not only within the corresponding normal ranges but also underwent just small changes (–4.6% and –5.7%, respectively) after renal denervation. In this context it appears equally remarkable that changes in sympathetic activity after renal denervation were tightly related with simultaneous changes in standardized systolic and diastolic BP but not to 24-hour ABPM changes. Such a discrepancy may depend on the fact that standardized BP measurements were made in synchrony with MSNAC, whereas 24-hour ABPM measurements were made the day before MSNAC. Furthermore, 24-hour ABPM reflects BP behavior over a much longer (24 hours) period (i.e., a period where MSNAC may undergo substantial variations). In previous studies neither office nor 24-hour ABPM correlated with MSNAC (8–10). Although we have no conclusive evidence to explain this discrepancy, the integrated nature of the estimates adopted in this study might have contributed to rendering our analytical setting more sensitive for capturing the functional correlates of sympathetic nerve activity. SDMA is strongly dependent on renal function (25). All patients in this study had a GFR<45 ml/min per 1.73 m2, and the MSNAC-SDMA relationship changed very little after adjustment for the eGFR, making it unlikely that this association depended on confounding by renal dysfunction. Overall, our data support the hypothesis that the sympathetic system may represent a common mechanism regulating the plasma concentration of both ADMA and SDMA levels. ADMA and SDMA result from post-translational methylation of l-arginine in proteins of nucleated cells by specific protein arginine methyltransferase (PRMT), and they are then released into the cytoplasm after proteolysis (4). ADMA synthesis is regulated by type I PRMT and SDMA by type II PRMT. ADMA is eliminated via a metabolic pathway by the enzyme dimethylarginine dimethylaminohydrolase, whereas SDMA is largely excreted unmodified by the kidney. ADMA and SDMA are also metabolized by an alternative pathway by alanine-glyoxylate aminotransferase 2, a mitochondrial aminotransferase expressed primarily in the kidney. The plasma concentration of these methylarginines in renal transplant patients correlates inversely with the renal expression of alanine-glyoxylate aminotransferase 2 (26). ADMA is substantially raised in hyperthyroidism (27) and critical illness (28), that is, two conditions characterized by high sympathetic activity (29,30) and enhanced protein degradation (31,32), suggesting that reduced sympathetic activity after renal denervation may attenuate the release of these compounds from methylated proteins. Whether the sympathetic system regulates methylarginines by interfering with the synthesis or the degradation of these compounds remains to be investigated in future studies. Our study has several limitations. First, our control groups are historical rather than synchronous, with the group of patients submitted to renal denervation, and the group we used to control for the effect of antihypertensive drugs on ADMA levels was composed of hypertensive CKD patients rather than patients with treatment-resistant hypertension. Long-term MSNAC remains unchanged over a 3-month interval in resistant hypertensive patients maintained on standard drug therapy (8). ADMA and SDMA are quite repeatable measurements (see Methods), and we documented in historical controls the constancy of both MSNAC and ADMA and SDMA over 6 months (i.e., the longest observation period postdenervation in patients included in this study). Second, our study was performed in a pathophysiologic condition characterized by very high sympathetic activity. It remains to be seen whether the same phenomenon occurs also in physiologic situations and in diseases in which the degree of sympathetic activation is less pronounced. In conclusion, in patients with resistant hypertension, time-integrated estimates of changes in sympathetic activity after renal denervation associate with simultaneous time-integrated changes in plasma levels of the two major endogenous methylarginines, ADMA and SDMA. These observations are compatible with the hypothesis that the sympathetic nervous system modulates circulating levels of ADMA and SDMA in this condition. Guido Grassi and Giuseppe Mancia received consulting and lecture fees from Medtronic. The other authors have no disclosure to declare. This study was supported by “Milano-Bicocca” University (Italy) and by the National Research Council of Italy. This article contains supplemental material online at http://cjasn.asnjournals.org/lookup/suppl/doi:10.2215/CJN.01220215/-/DCSupplemental.